After taking some time to let the most recent announcement sink in, our video producer Alex Olney is now confident Nintendo will be introducing a Switch pro model with improved tech, to support all of these lovely VR experiences. A hardware revision is also likely to help to encourage fans to get behind this new technology. So, what do you think? Is Alex onto something here? Is VR on a new Switch model meant to be? Tell us down below. I can see improved specs for a pro version, and VR is cool, but I don’t see VR (at least in its current state) as being anything more than a curiosity. I could be wrong, and Nintendo will somehow make it ‘mainstream’ - but I don’t see Switch VR being a game changer. Nintendo just keeps holding my wallet ransom. I've been stalling on buying a Switch, but a pro model may push me over the edge. I’d be game if they release a headset that isn’t made of cardboard and actually straps to your head. Am I confused, or do you have to hold the Labo headset while playing? Seems like an inconvenient hassle if so. Maybe nintendo has a surprise down it's sleeve but the way they even went "and we don't comment on rumor and speculation" this latest time the rumor of a Switch Pro popped up again felt beyond the usual "no comment" and was starting to feel like it was veering into the territory of being annoyed at people trying to hype up something that may well not be. I do expect something like a switch pro sometime down the line. But most likely it'll be something like the New 3DS(2014) which was released FOUR years after the original 3DS(2010). Or the PS4 Pro released three years(2016) after the original(2013) PS4. The original Switch released in March 2017. We just got out of March 2019. Two years is waaaaay too short of a lifespan for a major "pro" grade revision. A "fat" DS to DS Lite style revision leading to a model with the same graphics and processing performances as the original model but with improved chassis and battery life? But a performance improved edition? Two years is waaaaay not established enough to try and jump this on the users right away. Perhaps this could be the year they start going from -planning- to -development- in the intent of releasing it in March 2020 or 2021 but 2019 is way too short a time span for a console released in 2017. If it comes with new themes for the OS it'll be a day one purchase for me. Modern Vintage Gamer did a good video showing off what the Switch can do if it is overclocked as it currently is. I think the biggest limiting factor however will be heat and battery life. Fact is that the more power a device has the more heat it produces and the stronger battery it requires. If you actually open a Switch up you will see that the battery is actually already like 40% of the space and the fan like another 20%! While I want a Switch Pro, after learning these details I am not sure how feasible it is. A more powerful chip is already possible but can they put in a strong enough battery and cooling system? At best I think we could get an minor series of improvements, mostly a slight better battery and a 1080p screen. Anything more would likely drive the price way up and I don't think Nintendo is willing to do that. There is also the concern of releasing a device that is too much more powerful. If they made one that played games the original Switch can't it would divide the consumer base and we saw with the New 3DS and DSi exclusives that didn't sell well. Though they might be able to solve this by making graphics variable and not releasing exclusives for the new device but instead making games able to take advantage of extra power, without requiring that power. I don't really know. All I know is I want a Switch with a 1080p screen that uses all of its available real estate - ditch the bevels, wireless headphone support, more battery life, and either more internal storage, or a second SD card slot. In my view, the Switch itself doesn't need to be much more powerful for those quality of life improvements. @Ludovsky First of all, the original 3DS came out in March 2011 (not 2010), and the New 3DS was announced 3 years later. But the DSi was announced 4 years after the release of the original DS. We could've thought 3 years was too early for a new 3DS but it happened. While I'm skeptical about a new Switch being released this year I do see it as a possibility. So the idea is that to support some VR levels made for SMO and playback of BotW, Nintendo is going to release a Pro variant by April 26th? Because that’s when those updates hit. More likely is Nintendo is hoping to boost Labo interest by releasing these updates in addition to the base VR kit at half the price of previous kits. They’re more likely assuming that most Switch owners holding out on the Labo line already own SMO and/or BotW and will see the updates as added value. But sure, let’s go open Al Capone’s vault. @AlohaPizzaJack pretty much this imo. This labo VR update is very much more about giving labo appeal to mainstream users who'd been on the fence about Labo itself by having a labo product interact with -existing- mainstream games rather than the other way around of somehow"justifying" an incoming Switch Pro through "improved" labo VR support somehow. For those who didn't watch the video, the argument is more or less "The Switch screen isn't the highest resolution and this is more noticeable up close in VR, so maybe they'll make one with a higher resolution screen!" I think we're looking into it a bit too deep. Zelda and Mario VR support doesn't necessarily point to a Switch Pro, though I'm sure the Switch Pro is still coming anyways. Zelda and Mario VR support points to Nintendo wanting to actually sell Labo VR to their audience. Given how rapidly preorder demand rose once those two titles were announced to have Labo VR support, I'd say Nintendo is succeeding at their goal. Holding those cardboard goggles up to my face for hours on end playing BotW will be the most intense workout I've had in years. Yeah I proposed this idea yesterday. It makes sense. @Ludovsky If the 'enchanced' Switch releases towards the end of this year then it will be just a few months short of 3 years. The rumour said it's not going to be simply a power upgrade like PS4 Pro,it seems like it'll be a redesign.Better screen and better battery are a given. Bluetooth headphones compatibility is likely too. Perhaps it will use the X2 chip so it will have some more power but it's not going to be anything drastic. According to someone who's seen it, the design will surprise people. When rumours like this appear from credible sources, they turn out to be true more often than not. How about using the LABO for a Pokemon Snap remake/sequel? @Ludovsky nintendo isn't copying playstation and xbox's playbook here—they're going to iterate on the switch like a mobile phone...where yeah new iterations are rather constant. fortunately they have dynamic scaling resolution built into their whole hardware/software approach. the switch was a success because they didn't copy anyone—this is their opportunity to show everyone how old fashioned and slow microsoft and sony are. I can't say I would be against this. I have already seen the potential of VR, even though I haven't experienced it yet. Nintendo's new possible model would have a good chance of swaying me. @OorWullie there hasn't been any credible sources though. I hope if a Switch Pro does come out with better specs, they go back and patch all their big games to look prettier, I'm p sure xbox did just that when the X came out. Xenoblade 2 with a lil res bump and some improved textures (or just decent quality on handheld mode) would be fantastic. I'm not convinced Nintendo will fracture their market so. I could see a smaller model with attached joycons to replace the 3DS and an updated normal model with a bump in processor speed to increase handheld frame rates and an internal storage bump but nothing more than that. Nintendo's experiments with VR thus far point to their continued 'lateral thinking with withered technology'. People forget you need the joycons in the headset to enable motion detection which means running around Hyrule with your hands attached to your face: not very comfortable. It does seem more likely now, but you would have thought if they want to go to town on the VR experience they would have waited until this 'new revision' was out before releasing the VR stuff. Ideally you would want a 4k screen but that seems highly unlikely, so it will probably be a 1080p screen perhaps with some fancy screen tech to make the experience even better. The Switch is already capable of of 1080p output anyway isnt it, so it may just need a battery boost to pull it off. I don't think the labo vr points to anything but an attempt to save labo. I'd like a switch pro, but I'm a fanboy and want all my gaming on a Nintendo device. Not sure how they could do it at a competitive price point though? Particularly, as for newer chips Nintendo's competing with flagship phones, and a $1000 switch probably wouldn't sell. Erm... because Switch VR has been advertised for the standard model. Think with your heads, guys. Not with your hearts. Now let's point out the reason for the VR extras in SMO and BOTW; It's to encourage sales of the VR Kit to the Nintendo fans who weren't interested in the previous Labo kits. It's really quite obvious. I haven't watched the video yet... But how? If anything it points to it not happening as they can't increase the size without having to make a new labo kit set for the xl switches. Of course I don't think it means we won't get a switch xl, just that I don't think this labo is proof of one. No no no, you Guys got it all wrong.. This is just to ignite a bit of interest for vr in Ninty gamers. May 1st, Nintendo announces Valve Index support. @Torakaka not required to play the game of course, but a nice bonus if you get the kit. @Torakaka I can already set the uproar when gamers find out they'd be forced to buy an expensive kit they don't want, for a game they really do. @KingdomHeartsFan love with your heart, use your head for everything else. Gotta love these Nintendo Life speculations. Labo VR is too limited a device to base releasing an improved Switch for it. Also at the end of the day if an improved Switch arrived with a 1080p display it will still not be anywhere close to other VR devices on the market so I doubt Nintendo would release an improved Switch just for that reason. @pupypup Exactly. Your comment about it not being required to play makes sense too. I don't think Nintendo would go for a Pro version at all, the new 3ds and old version 3ds already created confusion. Just make a cheaper version with nondetachable joycons and smaller screen for 100 less. I bet a lot of parents would buy a 2nd one to play with their kid. @RazumikhinPG articles would drop to two a week if they didn't have speculative articles to fall back on. My personal favourites are 'Did (insert company name) just reveal that (insert character) will be playable in (insert game name)?' and 'Did Best Buy just accidentally leak Twilight Sword Waker HD Remaster and Pikmin 4 for Switch?'. @Lordplops wish they'd spend their time instead writing better, more complete reviews and adding more screenshots to articles. It's going to happen, and I'll be pissed off again, as with New 3DS (although it was all reduced to a couple games and the SNES games for the VC, which I wouldn't have bought anyway). It's the circle of life. The Switch Pro rumour was started by Sony to slow down Switch sales in the build up to their PS5 launch. I base that rumour on the same amount of evidence for the current Pro rumours. @justin233 This is because the Switch is far too big and heavy to be a screen in a vr headset mounted to your head. You would get neck strain very quickly. I can't see them designing any games around more than short bursts of gameplay for the reason you state - you'd be holding the thing up the whole time. It's also too low resolution to be a proper vr screen and I can't see a Pro Switch model having a suitable resolution for that either. Yeah, I could def see a Switch Pro really tying in with Labo VR at this point. It would be great to see Nintendo's take on VR getting an even better quality of experience as a direct result of a revamped version of the Switch with better resolution and stuff. And if Nintendo decides to release an actual proper VR peripheral for Switch down the line too then it would make even more sense for Labo VR to be like an initial test (one that's cheap for consumers to get in on), the updated Switch to show VR off even better in Labo VR, and then the proper VR headset peripheral to be the full realization of this. Seems like a smart path to go down imo. @Reydn If Nintendo were to release a Switch Pro that actually improved the Labo VR experience all round, and then at some point release a proper VR headset peripheral for Switch as a natural extension of this, I could absolutely see it being a huge hit for Nintendo. It was my idea too. The new switch could be improved for the vr. Will see. There's a possible technical chance that adding VR to Switch games really could be almost as simple as just flipping an option during development. That's literally how it works when you're developing a normal game in Unity: You can simply switch an option to turn on VR output for your game (and with some tweaking here and there to make sure everything else is suitably mapped for VR play, such as the controls, it basically just works). Genuinely, I took my friend's normal PC fps game that he made in Unity, pressed the VR option, and we were playing it in VR twenty seconds later. It was a bit clunky because the guns and controls and stuff were made for a normal PC and mouse and keyboard game, but the 3D VR view stuff worked perfectly and exactly as expected immediately. And I expect that with the Switch being able to change between the higher quality and lower quality TV and portable modes, largely really only to save battery when in portable mode from what I can tell, that you could simply tell any Switch game to run in VR mode similarly and it would basically run two versions of potable mode, with one on each half of the screen, that take up roughly as much processing power as the normal double resolution and slightly more detail TV mode does anyway. Or something like that. @KingdomHeartsFan Do you think a "Pro" version of the Switch will alienate the current Switch owners? I'd hate to see that happen...thanks. I expect Microsoft has given Nintendo inspiration and possibly technical advice. The step up in power and display by the 1X over the the original Xbox one is massive. Yet Microsoft haven't divided their audience. Games play on all Xbox one consoles, there are simply extra assets for Xbox 1X that only those consoles download and use so those games play better on 1X. Microsoft cracked the variable software problem. Similarly cooling they cracked too using a vapour chamber not a fan which was another first in gaming outside PCs. And vapour cooling is on some phones now. I expect a switch Pro would initially be very expensive but this is the right year for it as Nintendo has the limelight while Sony are quiet. @Joe-b I don't believe so. As long as Nintendo leaves the form and features of all Switch models identical, then nobody will be alienated. Which makes you ask the question, why would they consider other models if they have to stay the same? @YANDMAN As long as it's just an option. It's amazing how many are assuming this 'PRO' Switch will happen when Nintendo has never used such a term in their existence. It's just not their style. A 'Lite' is, and "New' is; but Nintendo are never going to present themselves as 'tech pimps'. VR appearing 'suggests' absolutely nothing Alex. They already have the product in place. The only tech bumps we've had in the past are things like the N64 expansion pack and the speed bump of the N3DS models. I know less people want it – but a more portable Switch is the far more likely scenario. They 'may' at some point (even soon) put in a 1080p screen, a processor that can handle the same experience docked and undocked, give us bloody bluetooth and make it a bit lighter. But that's more about refining and fixing glaring omissions on the current model - which is in accordance with past their refinement models. For those expecting a huge processor jump and masses of other bells and whistles – and a system that can play some games that the base model cannot – there is no chance and I'll happily eat my hat if I'm wrong. It's just too early and would damage the public opinion. We are TWO years in - the N3DS was 4 years in, and I believe that only happened because the 3DS was not a roaring success and needed to be reinvented/fixed (bad 3D etc...) in peoples minds. The Switch however IS a roaring success and Nintendo will be treading very carefully in order not to fragment that success. With a little more power, Nintendo will be able to have double the ports. 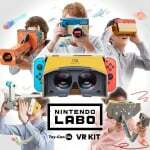 While Switch Pro would be neat, I do not see VR Labo indicating Pro coming. I think it's more like Nintendo tries to get more customers into Labo. I, for one, never considered Labo before, and now I already preordered VR. I also think that Nintendo may use the statistics to gauge the interest in more mainstream VR, so that when Pro does eventually come, there might be a more high-tech VR googles accessory or even VR dedicated console based on Switch. Not on my watch and not in my wallet. @carlos82 tbh I don't see a new "pro" switch releasing this year but what you said there(about ...the X1's hypothetical upcoming scarcity) might be the only logical explanation I could see to explain a "Pro" version of the Switch being released so soon. @YessMasster pretty much this. I don't know why anyone see this as a sign of the "new switch" while it's clearly about revitalizing Labo in a way that has more appeal to mainstream players who were uninterested in the more toy like kits until now. The closest I'd say players had been in Labo until now were the Robot and driving kits and even there their appeal has been more limited sales wise thus far, especially with the costs associated with the robot kit. It's probably not a coincidence that the VR kit might now be one of the cheapest to date in comparison. That alone tells me it's much more about making something affordable to finally attract people's attention in the product rather than something to get them to spend major money as one would for a new console. Pro -may- be coming eventually(the argument I've seen about potential future scarcity of the X1 chipset versus the X2) but it would be very much for other reasons altogether. At the same time it's also the antithesis of their own cgore philosophy guiding a lot of their development. And improvement in hardware are a whole different deal than software releases. We're talking about products with the to divide or even fracture their base, potentially even anger early adopters if a new model come or even replace the existing one in such ways all the adopters of the last 2 years feels forced to buy the new one. There's a reason for the 3-4 years time span before such an upgrade and often it's not too improve over the last model as much as to be about providing a stop gap before the next generations. There's also psychological perception. Even if an holidays release would make almost three years, the perception gettin the "year stamp" would still be that only two years had passed. The only thing I can see is not an "improved performance/processing/gpu" pro but more a refined "better battery, power consumption+perhaps storage" model like going from the DS to DS lite. If anything close to a pro happen it'll be only because of logistics stuff such as current chipsets becoming too scarce to efficiently produce in affordable ways if the next chipsets are also becoming numerous enough as to become as affordable than the old one for equivalent costs. Considering how often cost is something I hear from people still on the fence, that's something to think about. @KingdomHeartsFan It should be the only way to play it. @ReaderRagfish wait a sec, are there actually people that don't believe a Switch Pro is coming? Virtual Reality on a 720p resolution screen. Yeah no thanks! Even Samsung has given up on Virtual Reality with it's Galaxy phones and those screens already had a 2K screen resolution (aka 4 times that if the Switch screen). @YANDMAN VR makes quite a few people sick though. It wouldn't be like Nintendo to make a game that excluded people. Still, it would look awesome in VR. tHe wORlD WiLl eNd FeBRuArY TWeLFtH aT 13:13:13. ThE sIGnS ArE aLl tHErE. @KingdomHeartsFan yes, id hate to say, "gee I should have waited". Then get mad at nintendo for doing that...thanks! @KingdomHeartsFan Nintendo has the all new no sick V.R. The sickness is created due to the optical quality, so it depends on how that pans out. Imagine a limited edition Samus helmet V.R headset. @carlos82 And you realize that a Galaxy S10 costs more than three times as much as a Switch if you buy it off the shelf, right? The reason we rarely see people doing that is because most cell phone plans let you pay toward it each month in your bill. At 1000 dollars, the Galaxy S10 or iPhone X darn well better be more powerful! @carlos82 Very true! It'd be nice if they could also improve the textures and perhaps the draw distance a bit too tho. I'm not too sure how much work this would take. Genius speculation, considering that Eurogamer already released information about the upcoming Switch Pro and Switch Lite models.